Th-INK-ing of You: September Release Blog Hop!!! If you came here from the oh so talented Becca's blog, you are in the right place, if not, you may want to start at the beginning for a chance to win one of several prizes and receive lots of inspiration along the way!! For my project today, I wanted to show a little different idea of how this fabulous Seed Packet could be used, as well as the Garden Tag Set! I had purchased this picket fence container several months ago from a thrift store, as I knew I would give it a purpose one day! I then bought an inexpensive bunch of silk sunflowers from Michael's, cut and arranged them in my container, leaving room for my Seed Packet, to which I attached a wood floral pick. I added the gingham ribbon from my stash, and then tied on the tag with some raffia, also from my stash. The sets I used are: Seed Packet, Garden Tag, and one of last fall's release, Harvest Blessings. I also cut my sunflowers out in a flash with the Large Sunflower die made exclusively for this set. All images are stamped with Memento, colored with Copics, sponged with T Holtz Distress Ink in Forest Moss and Antique Linen, and the seed packet was spritzed with water after sponging. From here, you will hop to sweet and so talented Sabrina's Blog! Thanks for stopping and enjoy the rest of the hop! Good morning Grace! What a gorgeous tag and card, love how you used those sunflowers with this new set..Bet you thought I didn't notice :). oh, how I love this, Grace!! Clever you!! what a fab gift!!! So clever!!! Your project makes me want that seed packet stamp all the more! Thanks for sharing your talents! I love sunflowers and you made them twinkle! I love the way you made them talk and tell a loving story. thanks for sharing. This is stunning Grace! I just love the sunflowers with your green tones. So clever and gorgeous with the seed packet and tag!! Fun basket!! You are a creative genous my dear friend. Grace what an awesome basket you put together. I just love the tag for it. Beautiful! a gift anyone would love - the sunflowers really pop. Being an avid gardener, this set will be a fav for me. Love the sunflowers of course and your gift idea is so cute. Grace - Love that you used my State Flower in your presentation. What a beautiful tag. This would also could be used as a witnessing tool. Love it. OMGoodness Grace this is phenomenal! Love the sunflower theme!!! What a beautiful clever gift set. Your card and tag are prettier than the flowers! Love your project, thanks for the idea it's wonderful. A great idea. Make a wonderful gift. Love sunflowers. Great coloring. Grace sunflowers are my favorite, they are so bright and they bring a smile to my face when I am challenged. Thank you so much for sharing your beautiful project. What an adorable project, Grace! I love how you added the sunflowers to the seed packet image!! Hugs! This is lovely. Such a gift would make anyone happy. What a beautiful project. Love the tag. And the colors are pretty. God has really gifted you with creativity and I love how you used it today....the Sunflower die makes the flowers pop on the seed packet just perfectly and I love the garden sentiment tag. Can't believe you got the beginnings of this from a thrift store, lovely! How cute !!! Love the idea of making your own floral arrangement. So pretty. I love this project! Such a cute way of using the stamps. It is always good to see different ideas. Sunflowers. My favorite! Who wouldn't want this lovely arrangement so tastefully done! Your project is so cool. Love flowers and especially sunflowers. Could not have done any more on this to make it anymore Fantastic!!! What a pretty card! And what a creative idea :) I love those sunflowers! LOVE THIS! What a great gift idea or centerpiece or accent piece! It;s just wonderful! Blessings! Again, a sweet rendition of fall color. What a thoughtful and lovely gift. Absolutely breath-taking! So perfect for a home-warming gift or a hospital visit. This is gorgeous! I love this stamp set. Wonderful use of the stamps...Love it. I always love your ideas. i think this was a great way to use the basket. grace, this is simply magnificent! The seed packet is the greatest. So much you can do with it. Beautiful idea! Love the tag. Oh my word are you talented or what! Gorgeous coloring! Grace - Your project design is simply gorgeous. Love the fall release. absolutely stunning project, grace!! i love how you combined the seed packet with the sunflowers! Grace this is just lovely and those seed packets are great. Thanks for giving us a chance to win. What a beautiful presentation. The sunflowers are colored beautifully. This would make an impressive inexpensive gift that anyone would love to get. Great idea. What a wonderful project. Each time I visit your site, I have to scroll back to see all you've been creating. Delightful!!! Beautiful Gift idea. Thanks for sharing. 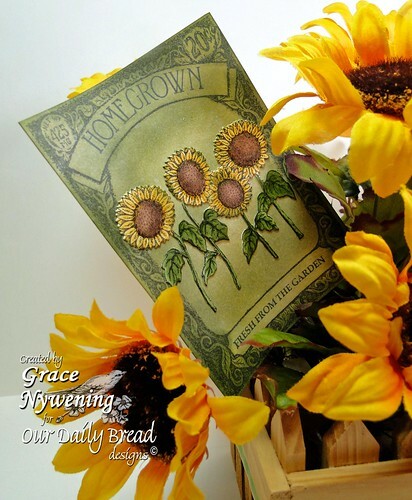 Grace -- your sunny basket of sunflowers coupled with the seed packet and tag are wonderful! what a gorgeous set!! I love it!! What a cute idea. I love these new releases. As a gardener who shares flower bouquets, this new release will give me lots of ideas for tags and notes. ps Grace... since following these ODBD blog hops I am adding your blog to my favourites. It is wonderful! wow, you really pulled all these elements together for a successful project. lovely! Love your card and tag. Oh Grace, now you have made me want to buy this! and the tag! Now if I could just grow anything to give away! Beautiful work! What a great idea! Such a nice gift or decoration for you! Love your stuff always! Grace, you always have such wonderful projects and I really love this one. Great combination of stamps and I am now truly ready for Fall!! Very cute project; thanks for sharing. Love this!!! What a beautiful gift! Grace, how fabulous is that : love this idea for alittle gift for someone special. This is simply AMAZING, Grace! The perfect little gift in a perfect little package! what a great gift to someone who needs a pick-me-up because sunflowers always do it for me. love the sunflowers on the seed packet and how they stand out from it. wow, great coloring. i love uses for other than cards and you always do such a nice job. Beautiful work, as always, Grace! I need to order these stamps! So adorable! I am loving this release! What a wonderful gift! I love these new sets! The seed packet has so many uses and the phrases are great! I love the cheerful look of the sunflowers! Thank you for sharing your creativity! Beautiful gift idea and design with the tag, Grace! Gorgeous as always. I just really like this. Your coloring is very nice. Great look and wonderful idea for a gift. Terrific, Grace! 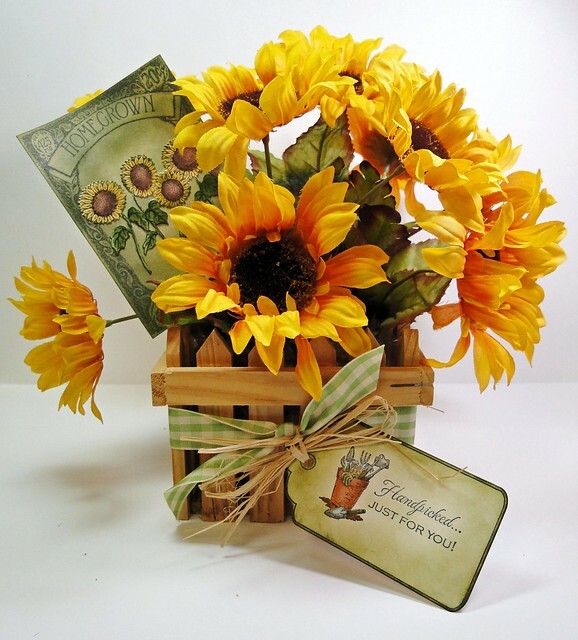 Your flower pot is fabulous and the sunflowers were perfect to use on your seed packet. Wonderful job! So cute. love seed packages. Preciosos y bendiciones son tus trabajos. 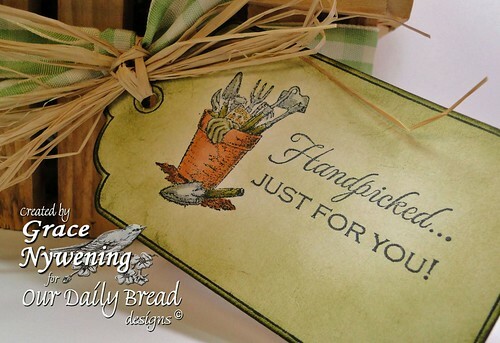 That would make a wonderful hostess gift for Thanksgiving and other autumn holiday events. I love the details on the tag. Thank you so much for sharing. Very nice, fall centerpiece! I love the colors and the combo of stamp sets you used. This is lovely Grace, we are coming into Spring in AU and it is lovely weather today so this creation is just right for the way I am feeling! Oh Grace, this is such a cute idea. I love sunflowers! Thank you for sharing. Was inspired by both you Sunflower & Faith Seed Packet Creations! Beautiful! Thank you for sharing your talents w/ us! What a great idea! This colorful bouquet will make someone smile very broadly. Love it! What a great gift tag! Good luck to all the blog hoppers! What an awesome gift for someone! I love the card and gift tag, just beautiful! What a very clever idea! Sweet fall arrangement! The seed packet tucked in with the blossoms and the little tag tied to the gingham ribbon are such a pretty use of the stamps. Love the techniques you used on the tags. What a great gift idea - love it! Wow! Grace, I can't think of one time that I've looked at your art work and didn't say WOW! Amazing talent from the heart and it show. This is beautiful! love your project. Grace, your creativity is awesome! I am so inspired by you! I ordered this stamp set yesterday! Thanks so much for sharing your beautiful work! love the colors of your project. Grace this is a beautiful arrangement, the coloring is simply magnificent!!! Love, love the sunflowers! Awwww, that is soooo cute! You are one talented lady! Absolutely amazing, scrolled through your blog and simply love your work, I find my spirit uplifted visiting your blog. Thanks for sharing. I am LOVING that seed packet!! So beautiful! TFS!